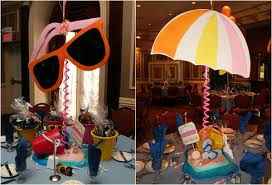 Summer themed party idea's in Delhi, Gurgaon, Noida and Faridabad. Plan your next party a Summer Themed Party with light summer colors like sunset orange, petal rose, sunny yellow, leaf green, pearl white, turquoise blue etc. Get the ultimate decoration service with floral pom-poms, square colored glass vessels that glow, fresh green tea & mint, ocean blue, citrus, vanilla scented candles, color themed table settings, outdoor lanterns, balloons. These delicate, elegant and exquisite pieces will add charm to the party. 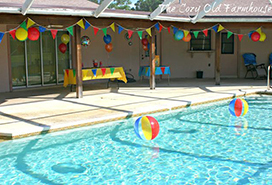 Our Summer Themed Party includes various themes like Beach theme party, Pool theme party and Summer Garden party. You will experience the coolest and the most amazing party ever thrown with your friends and relatives. Go ‘Gaga’ and ‘Mama Mia’ with us and feel the cool breeze with the coolest ambience in the party this summer. 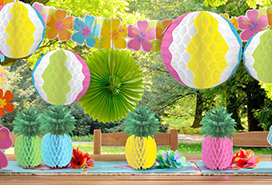 Enjoy the beach-like feeling in the party with beach balls, sea shell decoration, blue color theme, coconut trees dummies, volleyball at beach activity, summer dance party etc. Dress as your favourite disney character or decide any other dress code and theme for your coolest pool party ever. Inside or outside party theme, this summer make it a fresh, blooming heaven like place for everyone!